One of the greatest and most influential disciples of Thanthai Periyar, Dr.Veeramani established a huge ‘regime of reformation’ tip toeing the guidelines of his mentor. His exemplary leadership, his exuberant intellect and his magnetic managerial qualities, are all vivid from every reformative action of Dr.Veeramani. Apart from his many abilities, he was also an impressive writer, whose skills were honed by his mentor. He radiantly paints his aversion towards social injustice through his writings, which also reveal his intellectual abilities and deep knowledge in diverse topics. One of Dr.Veeramani’s celebrated qualities is his pragmatic approach towards everything. He relies on observation to reflect on the social happenings, rather than on hearsay. He tends to unify knowledge with reformation, in order to develop a workable solution that works for everyone. His writings throw light on various topics ranging from serious issues like evils of social discrimination, his agitation towards the so called upper-class society etc., by giving lovely advice to children on how they can be the source of social transformation. The main intent of his writings is to cleanse the social dirt that is scarring our society and to develop an optimistic approach towards intensifying human knowledge, individual freedom and create a dignified living. While Dr.Veeramani’s commendable literary skills silence the intellectual mass with his pennings, he has not spared the silver screens either. 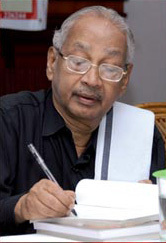 Though, we live in an era where movies are made for churning the big bucks, Dr.Veeramani has been busy making reformative movies that focus on the ideologies of Thanthai Periyar depicting the evils of social differences, suppression of women, the sickening clutches of caste system and many other social inequalities. In a period where cinemas are taken for pride and monetary benefits, the reformist utilizes his strength to educate the mass without expecting any commercial profits. This is Dr.Veeramani.